My weekend was ROUGH!! As you can see, that's not just with a capital R, but with ALL the letters capitalized. I was even looking forward to getting back into my Monday routine today, knowing that meant the weekend was over and it was back to the grind. However, I wasn't so lucky. I won't get into the details, but I do want to say that before it all hit the fan I was able to pull a menu for this week together. I can't guarantee we'll be sticking to it, but we'll try. Regardless, I want to share it as proof that I did accomplish something today. It sounds delish doesn't it? 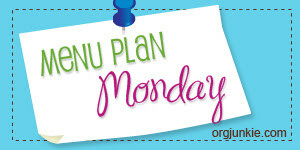 There's more Menu Plan Monday on I'm an Organizing Junkie.